Looking to invest in high-quality, easy-to-use wash lighting? Check out Chauvet’s SlimPAR series! Chauvet’s incredible SlimPAR series has become an industry standard. 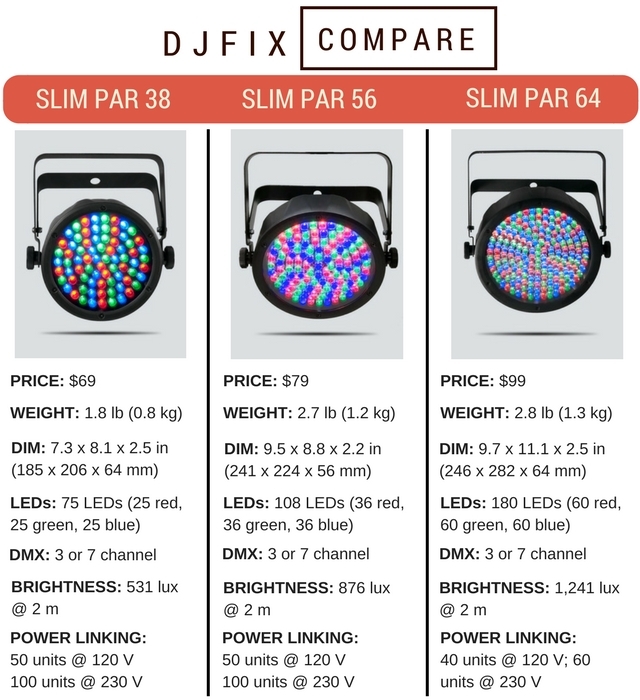 For any DJ looking for smooth RGB color mixing, DMX capability, and a compact design that’s easy to transport and place at gigs… look no further. This article will walk you through the unique features of three SlimPAR models – the SlimPAR 38, 56, and 64. Package Deals – includes lights, cables, cases, & DMX controller. Why go with a SlimPAR? We believe the Chauvet SlimPAR series is one of the best lighting options on the market, so we decided to do a review of three popular models within the series (SlimPAR 38, 56, 64). Reasonably priced and outfitted with essential features, these lights accomplish a lot. So what makes these units stand out? The Chauvet SlimPAR is compact. DJs who have been in the industry for a while remember the good ol’ days of bulky, heavy, inconvenient lighting fixtures. Thankfully the world of lugging massive fixtures is over. 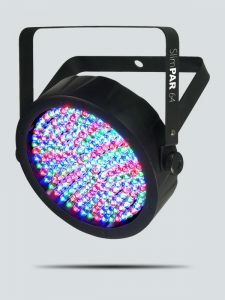 SlimPARs are some of the lightest LED wash lights on the market (the SlimPAR 38 weighs only 1.8 lb and is 2.5 in thick)! These lights can be easily stored and transported using the chauvet CHS-SP4 (for SlimPAR 36 or 56) and the Chauvet SlimPAR 64 bag. These lightweight fixtures are easy to carry around a reception hall or outdoor area, making a task such as uplighting much faster. Additionally, the compact nature of the SlimPAR series allows you to place them in hard-to-reach areas. There are a lot of impressive lights on the market, but not all have the ability to fit in compact areas. 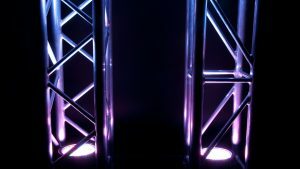 The possibilities are as endless as the context you’re in or the need you have… Slide a SlimPAR into a column of truss to illuminate it beautifully. Light up your scrim or DJ facade without cluttering your space. Conveniently mount a SlimPAR to a lighting stand or trussing. Whatever the application, these fixtures add a lightweight, compact glow to any setup. The Chauvet SlimPAR is affordable. The Chauvet SlimPAR is adaptable. Easy Mounting: Each fixture comes with a hanging scissor yoke. This allows you to conveniently mount any SlimPAR to a stand or truss. Each unit can also be set on the ground for uplighting and positioned at the desired angle. With solid, easy-to-use knobs on both sides of the yoke, you can tighten the light in place without worrying about it moving. Power Linking: Sometimes power outlets are at a premium and it’s impractical to plug in each light. Each model of SlimPAR can be power-linked (50 units @ 120V, 100 units @ 230 V). Thanks to the low-power draw of LED technology, you can link your SlimPARs together from a single outlet and greatly reduce setup time. Operate with or without DMX. DMX Compatible: Each SlimPAR model can be operated in either 3 or 7 channel DMX mode – giving the user a variety of lighting options. For those who are newer to DMX and desire a more-user friendly means of lighting control, check out the Chauvet Obey 3. This simple but capable controller provides an intuitive way to do color-mixing, static colors, strobe, sound active mode, and blackout. For the mobile DJ who desires to control wash lights via DMX, the Chauvet Obey 3 is a fantastic option. Sound-Active Mode – As a mobile DJ, there are few things as convenient as setting a light into sound-active mode, then walking away and allowing the light to perform. When running in sound active mode, each SlimPAR features a sensitivity knob which allows you to control how responsive the light is. This is a powerful tool for those operating without DMX. It creates a custom light show based on your music set – with a touch of a button. Automatic Mode – Each model of SlimPAR also features an automatic mode which includes built-in light programs. Set your fixture to the desired program and let it run wild! You can adjust the speed of the program so to reflect the desired vibe of your event, song, or set. Static Mode – Every SlimPAR comes with pre-programmed static colors. Simply choose one of the static colors, hit ‘Enter’ on the LED panel, and you’re good to go. This feature makes it quick and easy to find the perfect color for your event. Custom Static Colors – Want to create custom colors with the SlimPAR? This mode gives users complete control of the unit’s red, green, and blue LEDs. Color mixing is smooth and versatile, offering a hue for virtually any setting. Master/Slave Mode – Another convenient feature of each SlimPAR is master/slave mode, which allows one unit to control the actions of one or more SlimPAR units. Like the other four stand-alone modes, Master/Slave mode can be accessed via the LED control panel on the backside of the light. 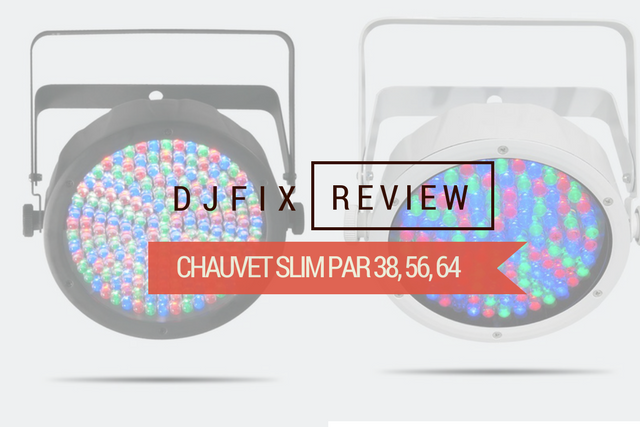 Is the Chauvet SlimPAR right for you? The technology behind wash lighting is developing at an exciting rate, which means new products are emerging steadily. Yet, the Chauvet SlimPAR remains a leader in the market for good reason. It is affordable yet offers customizable operation features like color mixing, sound active mode, etc. They are more lightweight and compact than many other lights which means easy storage, transportation, and setup. They provide incredible versatility when it comes to placement, allowing you to light up areas that require a tight squeeze. Featuring two modes of DMX control (3 or 7 channel), the SlimPAR line allows you to use any controller and truly customize your light show. Alternatively, those not wanting to use DMX can still access the unit’s features by using the built-in LED control panel. At such a reasonable price and with its enduring track record, the SlimPAR series is a worthy investment for any mobile DJ, venue, or club. We hope this review of the SlimPAR 38, 56, and 64 is helpful. To compare these three models, see the chart below.